A group of 12 youngsters from the Wild Boars football club plus their 25-year-old coach went in to explore the cave on 23rd June. But monsoon flooding cut off their escape and prevented rescuers from finding them for almost 10 days. The first four boys were rescued on 8thJuly at around 6p.m. local time, and were taken to a field hospital near the cave. Shortly before 8 p.m., the Thai Navy SEALs reported on their official Facebook page that four had been rescued. A second rescue phase began on 9thJuly and a further four boys were rescued. The third day of the mission successfully took place leading to the rescue of the final group of boys and their coach. How were the boys and their coach rescued? A team of 90 expert divers - 40 from Thailand and 50 from overseas - worked in the Tham Luang caves to get the boys and their coach out safely. The divers guided the boys and their coach through darkness and submerged passageways towards the entrance to the cave system. The rescue process included walking, wading, climbing and diving using guide ropes. Wearing full-face masks, which are easier for novice divers, each boy was accompanied by two divers, who also carried his air supply. The toughest part of the escape was at a section named “T-Junction” or “choke spot”, which was so tight that the divers had to take off their air tanks to get through. After the tight spot, a cavern called Chamber 3 was turned into a forward base for the divers. 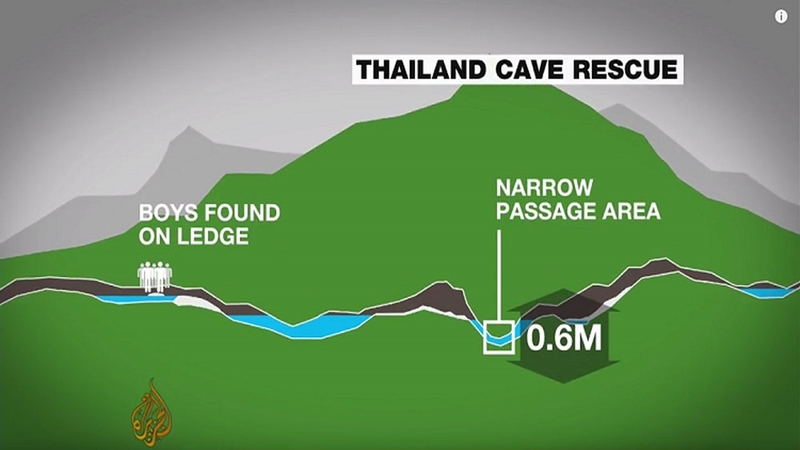 The boys could rest there before walking out to the entrance of the cave, where they were then taken to hospital in Chiang Rai. They were rescued in stages between Sunday, 8th July and Tuesday, 10th July, when the final four boys and coach emerged to safety. On 18th July, the boys left hospital and made their first public appearance, recounting their “miracle” survival story in front of the media. Estás viendo los artículos del blog English de las Agosto 2018 .